Nobody seems to have mentioned the SV650 - any reason why? Looks beautiful! As mentioned, used by a lot of schools which I guess gives it a bit of a vanilla stigma. A perfectly good, and vfm, starter bike imo. I like the look of the CMX - it caught my eye in the local dealership (Letchworth ). I was surprised it was only a 500 but that wouldn't put me off. 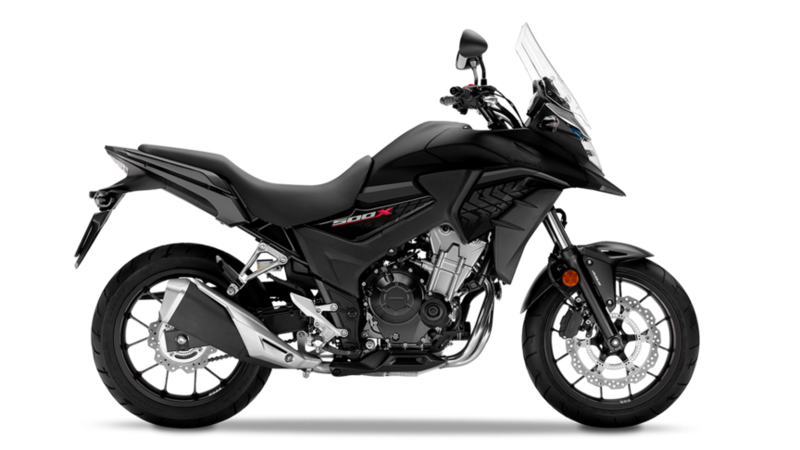 Interestingly, and moving slightly away from street/naked territory, I've just watched about half a dozen review videos of the Honda CB500X, which is one of their "adventure" bikes. It seems to be the perfect cross between a street bike and a small tourer, and every reviewer absolutely loved it. In fact, having seen the way that it handles in town, as well as its ability on the open road, i'd be nuts not to test it. My only issue with the CMX500 is that it might be a bit vanilla, and probably requires a bit of customisation to bring it up to a slightly better spec. However, the two Hondas are probably better in terms of power as I fear some of the others may be a bit much as beginners bikes. Last edited by learningtofly; 12th August 2018 at 10:03. IMO don't write a bike off because you think they may be too big or powerful. Clearly the throttle is a two way device. As your experience grows you will sometimes need/enjoy a bit of extra poke. Also, the way the power is delivered is a major factor in how much you will enjoy the chosen bike, the Street Triple has a very linear power delivery from quite low revs, with a bit more at the top end, the Scrambler has a lot of low down grunt, but not so much of a top end rush. Again, have a reasonable length test ride on all the bikes mentioned, as you may find a gem, or dodge a bullet. One mans meat an' all that. I would classify myself as an 'experienced' rider at 61, having had bikes since I was 18, and can probably adapt my riding to suit most bikes within reason. However, as a first bike you REALLY need to get it right first time or you could be put off for life, and waste a fair wedge. Test ride as many of your shortlist as poss for as long as poss to find out what suits YOU. Right now - it would be the BMW S1000xr - The Thruxton just doesnt do everything that the XR does (for me). I've ridden bikes since I was 13 years old. Obviously, off road at first, then on the road since 16. Last year, I passed my full test after a lengthy break from riding (21 or so years). I bought a minty CBR600F (2002) that had been loved and cared for by a metropolitan police motorcycle instructor. I got on it at first and sh@ myself because, beleive me, it flies. Like the rest have said, the throttle is a 2-way thing and power/torque delivery should not phase you, or be a game changer in the selection process. I've since riden the bike around Brittany and put 2,000 miles on it and love it. Seeing as you’re looking at unfaired bikes, take a look at the BMW F800R. looks good, plenty of seat and height variants, decent but not overwhelming power. Mrs Berin has done 50000 miles in the last 4 years on the faired version, the F800GT, and it’s a cracking bike. If if you like the adventure bike style there are a lot better options than the Honda, which is built to its very cheap price, cheap suspension, poor brakes, and less than 50bhp to shove nearly 200kg along could get tedious quite quickly. It’s a mystery to me how Honda make their bikes so heavy. I've ridden bikes since I was 13 years old. Obviously, off road at first, then on the road since 16. Last year, I passed my full test after a lengthy break from riding (21 or so years). I bought a minty CBR600F (2002) that had been loved and cared for by a metropolitan police motorcycle instructor. I got on it at first and sh@ myself because, beleive me, it flies. Like the rest have said, the throttle is a 2-way thing and power/torque delivery should not phase you. I'm glad you posted that, as it's quite reassuring. When I was in my late teens/early-mid 20's we all rode bikes. I started on a CG125 and then went to a 250 Dream (both Hondas), but rode the latter without a full licence. I've not ridden a bike in earnest for 30 years, so I'm approaching this exercise as a complete beginner. With regard to capacity, he one thing at the back of my mind is that engines perform differently at low revs; whilst I accept the point that a very linear power delivery can overcome this I still think that a slightly smaller engine used to it's potential may well be preferable to a bigger engine not. I'm hoping that some test rides will shed more light on that, though. I'm glad it's helped. I'm fully subscribed to the thread and look forward to hearing how you get on. Tony, you are on such an exciting journey. Enjoy all the test rides and let us know how you get on. To avoid inappropriate additional recommendations, it might help to know your budget. BTW, if you thinking of going the adventure bike route, try the new BMW F850GS. I am seriously thinking of chopping my underused RR for one in the Autumn, for a bit of greenlaning. Last edited by Skyman; 10th August 2018 at 18:23. Reason: Corrected model ref! That is the right attitude and try them. Provided you stick to a street / touring style don’t fear the capacity or bhp too greatly. Sports bikes yes as they are “highly strung” So brakes and handling will not be forgiving. Also tourers can be very tall which you are wise to be wary of. I had an Aprilia Pegaso a great bike but very tall and underbraked so in my opinion not so good for a novice - particularly the height as although it is easy to use the camber or slide over very easy to get caught out without experience. The best advice is always to get a popular middle of the road bike and in a year’s time you will either know what you want or by looking at the modifications you have done realise what you need as a “keeper”. Also invest in some decent gear as it will extend your riding season and enjoyment massively. Good question, but I don't have a specific number in mind. Given that I'll have to spend about a grand on a helmet and insurance (I've been a closet biker my whole life so have a wardrobe full of jackets ), I suppose I'd like to keep the bike cost to around £6-6.5k ideally,; then again I'd stretch that to anything under £10k for the right bike, or buy used if that made more sense. Avoid bobbers and coffee shop nobbers like the plague. But the practicality of a holed bucket. Initially fun, but once you need to do big miles, or tour, you're pretty much screwed. Something like the MT07? Perfect. But if you only ever want trips to the (coffee)shops, where is the bother? Was thinking the same I do 10-12k a year on bikes and I don’t think I’ve had a ‘sensible option’ ever. Well maybe the 440kg street glide!! Have you test ridden the Softail deluxe? And if yes could i have your impressions, please? Only briefly. A lot like the fat boy. Rock solid and steady. Good looker too. There’s a saying in HD world that ‘everyone ends up on a road king’ so that’s on the path. Hi Tony, I have a Fat Boy if you fancy trying one. Great bike. I am very pleased with it. No bother, but you won't learn how to ride a bike going to the coffee shop. So you get another for longer jaunts. And a sportier one for spirited rides. The beauty of motorcycles. So cheap compared with four wheel transport. There are three points of contact on a bike, arse, hands and feet. As a start off trying sitting on some of your shortlists in the showrooms. People fit bar risers, lower footpeg kits and low seats to customise a bike to their preference. Bikes like the BMW GS range 700/ 750/850 will give you a high up sit upright position. All are available with low seat or low chassis. Often they have aftermarket screens for big miles. A Ducati scrambler will feel similar but slightly forward, no big screen option on a scrambler, so more than 40/50 miles on a motorway will be tiring. Back line riding will be a hoot. Turning to the Yamaha and the Street Triple you are adopting a more agressive forward position. The Street triple is a real head down arse up tool. It will suprise with its performance, which can shame many larger bikes. The Mt07 / and 09 have been credited in reviving Yamahas fortunes when the R1 started to head north of £13K. See mcn report on Mt09 SP. both of these bikes are excellent choices and having been around for 5 yrs ish should provide a good source of low miles pre owned. Did you actually bother to read the OP's requirements? "Please bear the requirements I mentioned in mind - I don't want a sports bike, and I don't want anything bigger in terms of engine size...."
Appears he's looking for a first motorcycle to cut his teeth on, doesn't appear to be needing a bike for every day of the week. Is that the current Fat Boy, or the last generation, or the one before that...? I tried the current generation earlier this year and it was astonishing better than the ones that came before. Mine is a 2008 Fat Bob. Fuel injection. Stage one. Lots of noise. Easy to maintain. I just chug around on it. Although it did get a run on a TX GTG earlier in the summer. In the end I just bought a vfr750 - cheap, does everything well, reliable and enough power to ensure I don't get bored. Now I have a much better idea what I want from a bike and I'll probably end up keeping the viffer as a commuter bike. Glad I didn't spend 6k on a naked triumph! Chaps, is there a reason nobody has mentioned the Street Twin, as opposed to the Street Triple? I understand that it's outside of my intended engine size, but I can't help but note that it's a slightly lower seat height (better for me) and is a seemingly good ride at lower revs (also good for a poddler and casual rider, as opposed to someone who would give t a bit of a thrashing). 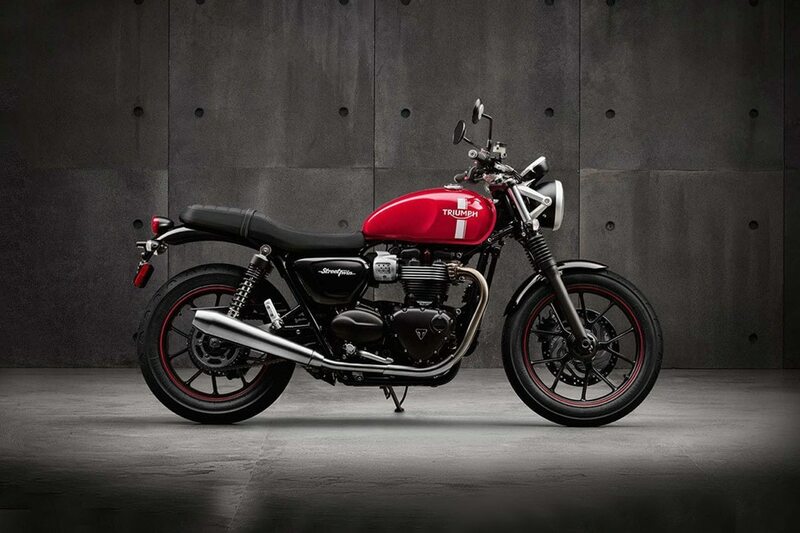 Anybody have any real-world experience of these, as the classic Bonneville looks are certainly doing it for me visually? I'd certainly be interested on opinions as to how it stacks up as a beginner bike against the Street Triple. Last edited by learningtofly; 12th August 2018 at 12:19.
you really need to get out and test ride the ones you like the look of , personally if i were you i'd get something i liked that is a good few years old as most new bikers realise they have bought the wrong bike after a 8-12 months in the saddle and end up changing it. you may decide you want something quicker after a short time or you might decide a tootle round posing machine is more for you . re: the sv 650 , i recently had one for a few days as a courtesy bike while my speed was in for its 12k service , personally after the speed triple it felt like a bag of junk that would not pull a tooth out of a dead horses head , however for going to and from work and running into the ground without ever having to touch it other than putting petrol in it would be perfect. Last edited by pugster; 12th August 2018 at 09:37. Tried one before buying the BMW. Loved the engine but not so impressed with chassis/suspension and brakes. I think you need to stop worrying about engine size and think more of engine characteristics. Singles have the best low down torque but rev lowest and have least top end power. Fours are typically flat at the bottom, rev highest and have lots of power at the top end. Twins and triples sit in-between in a similar way. There's also the state of tune of the engine; whether it's tuned for a relaxed ride or a high performance ride. Where I'm going with this is it's not all about ccs. The street twin is a fairly relaxed twin (54bhp) where's the smaller engined Street Triple is a more highly tuned triple (106bhp), so the characteristics will be quite different. Thanks for that - and understood (which is really why I asked about this bike, given that it's probably more aligned with the kind of riding I have in mind). As an aside, I hope this isn't getting boring. I still have to get through my DAS, so it's a little too soon for me to be testing bikes. However, it's really helping my general understanding of what's out there (and where my focus should be), and also throwing up some ideas that I wouldn't have considered. Emotion plays a huge part in our choice of motorcycles. I've always maintained that if you don't look back at it over your shoulder when you've parked, or go into the shed with a cup of coffee just to look at it...you've bought the wrong bike. If you like the look of the Street Twin, and it gives you a bit of a tingle in the nether regions....go for it. Tried one before buying the BMW. The “stop worrying about engine size” is certainly the best advice you can take. A 1200 cc HD will be easier to master in terms of power delivery than a Duke 390, less than a third its size. The other advice about getting second hand first is sound too, but if you can easily afford to get brand new there is no harm. Remember thought that you will be caught out and you will drop it, most of the time when manoeuvring at a stand still (sloped curbs are a trap), especially if you are short arsed. Yes, that's why I'm very conscious of seat height (as I'm a short-arse ). The Twin is a few inches lower in that respect than the Triple, and it's also been around since 2016 so a fair few about on the used market. Another trick is to learn to never park front wheel first against a curb: bikes don’t have a reverse gear and even a slight incline makes it very difficult to leave. Provided what floats your boat isn't either a 160+bhp sports bike or a 500cc two stroke from the early 90's, you're probably going to be OK on it. Regarding the Triumph Street Twin, I've not ridden that particular model but I have done a good few miles on a Triumph Scrambler which is almost the same bike. I really like the Scrambler, it's not overly fast but it's a damn good B road fun bike. The engine is a cracker, lovely and flexible with plenty of low down power, doesn't go much quicker if you rev it but that just adds to its character. From what I gather about your requirements, I'd say it was a darn good shout, probably the best one yet. It was very hard not to say "told you so" when a mate, a 50-year old beginner, dropped his new triumph in a petrol station. We'd told him repeatedly that he should buy something older or pre-disastered first but he was having none of it. Brilliant - thank you. It’ll be on my list for sure. Been riding over 40 years and was caught out in a similar way like that last year. Didn't realise the front wheel was on a slightly raised section. Sidestand was too short because of it and down it went. By the time I realised it was too far gone! Much to the amusement of my buddy who was with me! Last edited by learningtofly; 13th August 2018 at 10:24. It does look nice, but I think I'd want to go for the 2016-onwards bike.